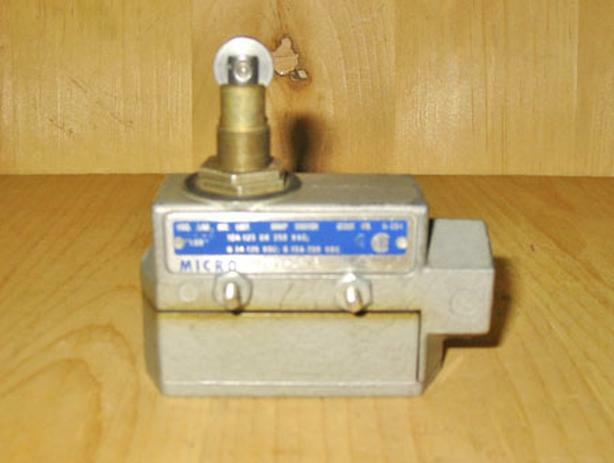  Log In needed MICRO SWITCH DTE6-2RN80 Snap Action Limit Switch (10A @ 125/250VAC) ~ Rare! Up for sale is an MICRO SWITCH DTE6-2RN80 SNAP ACTION SWITCH with TOP ROLLER PLUNGER (Enclosed, Compact Limit Switch by Micro Switch). MICRO SWITCH™ E6 (Side Mount) Snap Switches have a combination insulator/seal cemented inside the bottom enclosure. Lead washers are used to seal the mounting holes on side mount switches. Removal of the bottom enclosure exposes the terminals for easy wiring. and comes with additional specs. outlined below ~ please feel free to email me for price, pick-up or shipping information. * Operating Force: 20 - 40 Oz. * Over Travel: 0.125 In. * Pre Travel: 0.11 In. * Release Force: 6 oz.